I will always be a working mom, at least part-time. And I don’t feel guilty about it. Not even a little. In fact, I feel the opposite of guilt. For me personally, I think working as an emergency room RN has helped me be a more present and compassionate mother than if I didn’t work at all. I see things that most other moms don’t see on a regular basis, like patients with critical injuries, long term illnesses, or chronically sick kids. As an emergency room nurse I help patients and their families through some of the worst moments of their lives. These experiences put things in perspective for me. For every day I spend at the hospital, I gain more gratitude for having a healthy, happy family. Don’t get me wrong. Being a working mom has its drawbacks and adds a lot of challenges to my life. As an RN, I work anywhere from 24 to 40 hours every week, which is time away from family. Fortunately, I found a little bit of a work-life balance by becoming a per-diem nurse. 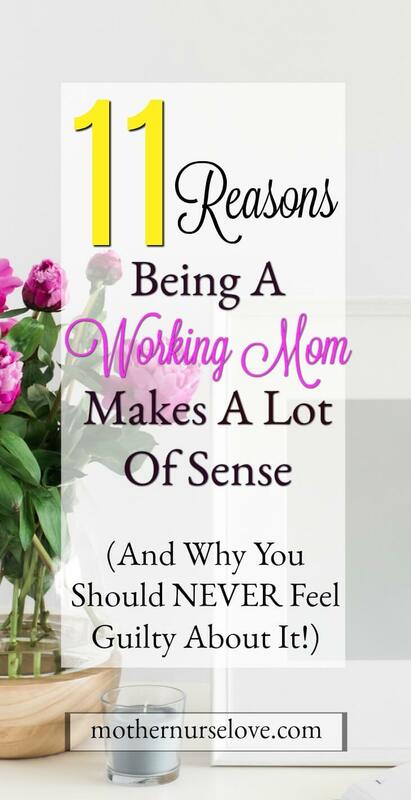 But I still see several important benefits to being a working mom that are keeping me in the workplace. #1. Since I don’t get to be home everyday, I never take my “stay-at-home mom” days for granted. I absolutely LOVE my days off. I adore starting my mornings with a ten-minute toddler snuggle session, then heading down to make pumpkin pancakes for breakfast. We have time to play for a bit, read a few books, and then stroll to the park where we meet up with some of the other moms and toddlers from the neighborhood. My daughter takes a nap at 1pm, during which I also squeeze in a short nap. I relish in my “at home” days because I’m not always home. There have been weeks where I didn’t work at all (like when our nanny went out of town for two weeks). I got so used to being home that I stopped appreciating being at home as much as when I didn’t do it everyday. #2. I have a constant stream of intellectual stimulation. Admittedly, I am a closet science geek. And I love the cerebral stimulation that I get as a nurse. I have had patients ranging from 2 days old to 108 years old. I have had the opportunity to see more disease states, complex injuries and unusual diagnoses then I ever could have imagined even existed. It would not be an exaggeration to say I learn ten new things everyday at work. To top it off, I am surrounded by some of the most intelligent people I have ever met. Many of my co-workers have the same drive for helping people I do. They motivate me to keep learning. #3. I love our nanny, and she is teaching our kids to speak Spanish. I know women who didn’t want to work because they didn’t want someone else “raising their children.” I, however, do not see any competition whatsoever. And my child adores our nanny. Most importantly, I am grateful for the different experiences that our nanny can give our daughter that I cannot, like teaching her Spanish. My baby is actually saying some of her first words in Spanish! The gift of bilingual speaking is not to be taken lightly, and will benefit her brain development, help her in school, and give her broad cognitive advantages compared to her non-bilingual peers. #4. My resume is staying up-to-date as I continue to gain valuable work experience. It is important for me to keep one foot inside of the career door. I have spoken to a lot of moms who took off up to five or more years to stay home and then couldn’t get hired again no matter how hard they tried. It is sad to say, but stay-at-home motherhood can be like a blow torch to a resume. #5. I am a good role model for my kids. #6. 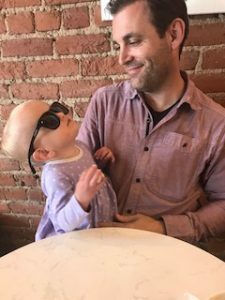 My husband spends more one-on-one time with our daughter. One of the benefits of being a working mom is that my husband spends more on-on-one time with our daughter. Engaged dads help kids flourish. I work 12 hour shifts on Sundays, so my husband runs the house from 6am until our daughter goes to bed at 7:30pm (and also after 5pm on the other 1-2 days I am at the hospital). As a result, my husband is super involved with the day-to-day care of child rearing. He cooks, changes diapers, cleans, feeds the kitties, does bath time, plays with, reads to and keeps our daughter safe. (Their have been a few questionable outfit choices from time to time- but it’s adorable). Engaged dads help kids flourish. Many dads I know wouldn’t even know what to feed their kids nor do they get the opportunity to form their own special routines. Men shouldn’t get “extra credit” for child-rearing, yet sometimes they do. In our house it is a more level playing field. #7. Work enriches my marriage. My husband can share pieces of his office drama with me and I always have a fascinating “I couldn’t make this up if I tried” story. 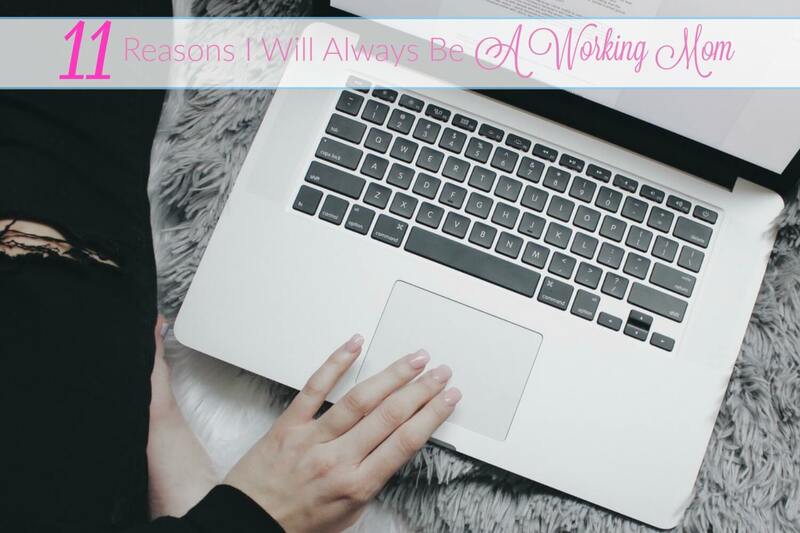 Work makes it possible for me to discuss other interesting things besides play dates, toddler meal planning, diaper changes and shopping for kid stuff. Don’t get me wrong, I LOVE talking about my child. I could to it all day long. I just don’t think it really helps in the intimacy department. Conversing over interesting thoughts and stories is definitely more of a turn-on. #8. Working keeps me disciplined. If I stayed home every single day I would rarely shower or get out of yoga clothes until the evening. For work I wear scrubs and yes, those are kind-of like pajamas, but I still have to clean myself up and be presentable for co-workers and my patients. Since I leave at 5:45am on work days and dont get home until 8:30pm, I am left with zero time for anything else except showers and food prep. Therefore I have to be more strategic and military-like in my scheduling about things like cleaning, shopping, meal planning, social events, and other general day-to-day activities. It forces me to be super-organized. And as a result, I am (almost) never late for anything. (Read more about how I prepare for a 12 hour shift as a registered nurse). #9. My savings accounts are still growing rapidly. Obviously, If I didn’t work I wouldn’t receive any paychecks. I’m not an over spender and fortunately my husband is able to pay all of our bills (except childcare- which I pay for). That means that the majority of what I make gets stocked away into different savings and investment accounts. During the first 12 months after my maternity leave I was able to increase my personal net worth by 100K (my husband and I obviously share our money, but to make my point I am only talking about my accounts and contributions). This includes income from my paychecks and my retirement investments. If I was to stay at home just for 5-10 years at this point in my life, I would literally be talking about millions of dollars lost over time, in savings alone. Especially after factoring in compounding interest. And I’m only working two 12-hour shifts a week a lot of the time! My work can make a significant monetary impact. I enjoy contributing to the financial future of our family. (Read more about how I paid off 27K in student loan debt in under a year and how I saved money for my unpaid maternity leave). #10. My kids wont grow up thinking I didn’t do anything. Sadly, a mom’s work doesn’t get the kind of credit it should. Being a mom is a hard job. Unfortunately many kids don’t understand that being a stay-at-home mom is a job too. In some cases they grow up wrongly thinking that mom didn’t do anything. Conversely, they think dad did ALL the hard work because he worked outside of the home, which is a very unfair assessment. Talk about a double standard! #11. My child is thriving. Our daughter is already an amazing, smart, charismatic little lady. I hope that my husband and I continue helping her to be an independent, assertive human and the best version of herself that she can be. This may be all in my head, but she is not even two yet and is already showing me that she has a good work ethic: she picks up her toys, helps with cooking in the kitchen (it gets messy, but who cares? ), moves items around the house (redecorating maybe?) and even throws away her own diapers. And she is so proud of herself for these achievements. I want her to continue building confidence by taking initiative, having the opportunity to learn through both winning and losing, and discovering the value of hard work. That, after all, is how we all grow and learn. Do you have any thoughts about being a working mom? What are some of the benefits and issues that you have encountered?